How to Wash Your Car by Hand: It’s Easier Than You Think! It’s easy to take your car to the car wash. In fact, the car wash is such a venerated lifestyle that it has even been venerated in the vintage disco tune named after such establishments. But going to the car wash takes time and costs cash. Why wait around in line, when with just a small amount of time and effort, you can enjoy a virtually free car wash with the full satisfaction of knowing you did it on your own? Washing a car yourself is actually incredibly simple. It can also be a relaxing activity, a good way to get to know the ins and outs of your car, while doing something practical and worthwhile. You will feel a stronger feeling of satisfaction after washing your car than you might with a quick trip through the drive through. It doesn’t take too long, and if you want to enjoy the weather outside on a beautiful weekend afternoon, it might be far preferable than going through a machine. That’s all you need! Now, before you wash the car, it is generally suggested to park in a shady location. Ever wonder why professional car washes are always covered? Sunlight can dry your car before you are ready, so try to stay away from it. A shady location is best. You do not want the soap to dry on the vehicle. Wait until after you have washed, rinsed and wiped dry before you pull out into the sunshine. If you are washing in your own driveway, you may not have this option – you can still get a decent wash, but you might be better off waiting for the clouds to roll in. The bottom line is that, for top quality, do your washing in the shade, then get in the sunlight to dry. If possible you want two buckets: one for the wash soap, one for rinsing your cloth or sponge. If you only have one bucket, you can use flowing water for the latter. First, fill a bucket of water and add your car wash soap as advised on the bottle. If you have a second bucket, fill that one with clean water. If you don’t have a second bucket, don’t worry. You can use running water straight from the hose. The important thing is to rinse off your wash cloth regularly to prevent scraping the paint with dirt picked up while scrubbing. 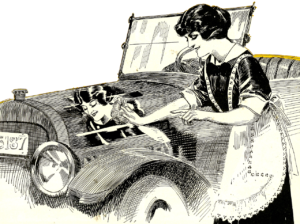 If you have some really nasty spots on your car, you might want to start out by pre-treating the filthiest areas with pure, undiluted soap. Then, while waiting for the soap to do its work, take a few minutes to scrub the wheels – here a brush or sponge might be best, but is not necessary. Then give the car an overall rinse to wash off whatever will come away most easily. You don’t need to work harder than you have to! Get out that garden hose and really soak the car, making sure to wash away as much as you can with just the water. This is the simplest step, but also the most time consuming. Scrub your car from top to bottom, fender to bumper. Make sure to rinse the cloth or mitt regularly, either in your bucket of clean water or with the hose. Most parts of the car shouldn’t require heavy scrubbing. Use a circular motion and don’t apply too much pressure – you don’t want to leave scratches behind – but do make sure to pay special attention to areas that are visibly soiled. Some suggest giving the whole vehicle one last wipe down with soapy water before finishing. Then pull out the hose again and give it a complete rinse. Use a gentle water flow without any kind of spraying nozzle. Let the soap wash away gently. The idea here is to avoid leaving water spots or scratches. Lastly, to further protect against water spots, dry the car promptly with an appropriate drying towel or chamois. It is really that easy. Just follow a few simple steps and you can enjoy a professionally cleaned car in just a little bit longer than you would spend waiting in line at the car wash – and for a lot cheaper! Learn More About Cleaning Windows.